From @BalancingMama: What do I do with Pinterest? I enjoy browsing through Pinterest if I need a bit of down time, but what exactly am I supposed to DO with it? I am not a crafter. I'm not much of a cook. I barely get my kid fed, bathed, and kissed goodnight before I need to crawl between my own cozy sheets. I do not have time to make adorable goodies and heartfelt, super creative gifts. I would implode if I stayed up through the night making things - I am a girl who needs a good night of sleep. Pinterest is supposed to be the next big thing - but I see it as a niche spot for super creative people. Is it mainstream? What do I do on Pinterest if I do not craft, cook, or create? I am not planning a wedding, and we have one birthday party per year. What do men do on Pinterest? Help me out here, friends. What do I do with Pinterest? 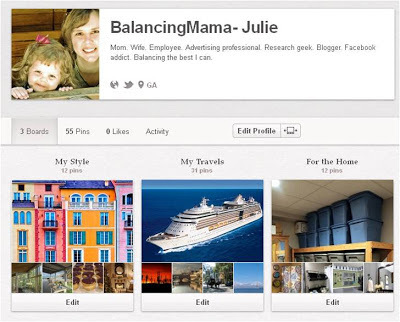 Bloggers, if you have written about Pinterest, feel free to leave a link in a comment! Please include your email for me so I can reply personally with my thanks.